So, Hasbro’s trying to bridge the gap between the OTC line and the upcoming Episode III figures huh? Does that mean we get new figures as opposed to the rampant repacks found on those black and silver cards. Yup, a few new guys and girls to tide us over. 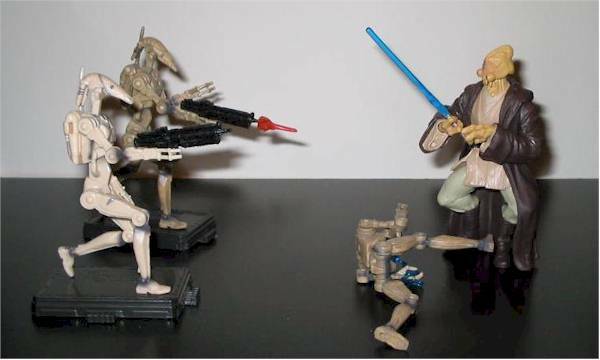 Out of the five figure-wave currently hitting the shelves, two are from the Phantom Menace, the others from the Attack of the Clones. Tonight I look at two of the AOTC figures, since I have no idea what to do with the Wookie senator if I should open him. Here are Sly Moore, Chancellor Palpatine’s aide; and Pablo-Jill, Jedi Knight. Yup, I dig the retro silver and black. The packaging is simple and very well done with a nice headshot of the figure on the front. I like that each figure has it’s own unique background photo art as well. One thing that’s slightly awkward is what Hasbro’s done to replace the OTC logo at the bottom of the bubble. The figure’s name is still at the top of the bubble, but the logo area now reads as the character’s description, such as “Geonosis Arena” for Pablo. This text is far more eye catching than the actual nameplate. What a difference when compared to the PM figures found in the same wave. Then again Hasbro usually does better with the more unusual looking characters. Sly Moore was seen for probably less than thirty seconds in AOTC along side Palpatine, but she certainly stood out with her freaky-bald-chick-in-ostrich-feathers look. Since we really didn’t see anything except her head and the outer robe, I don’t know if Hasbro’s version takes artistic license with the figure or not. The head is pretty serviceable, with a nice narrow look to it, but the eyes seem a little too big and staring for the character. Her under-robe has some nice cross-hatching to it, and is sculpted to match a walking stance. Her arms are wrapped in bandages via the Bride of Frankenstein. Like the other females in this wave, she does have some sculpted legs hiding under the robes, complete with circa ‘70’s, shag cavemen boots. Okay . . .
Pablo-Jill (I don’t even want to get into how moronic this name is) is one of the numerous Jedi seen in the ending battle sequences of AOTC. 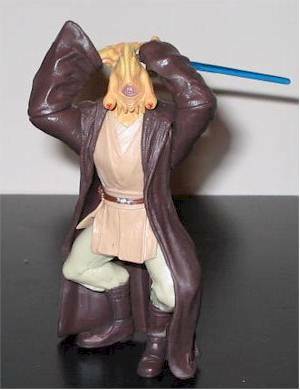 We can always use more Jedi Knights, especially the weirder-looking ones. For the most part, Pablo doesn’t disappoint. The head is pretty cool to look at with its upper set of jaws, and lower eyes. I wonder where his nose is? The hands are also really well done and can hold his lightsaber quite well. Hasbro shows that they have Jedi robes down to a science with this guy, now they just need to work on their sculpted poses. The legs are sculpted well, but the pose is awful. Pablo’s in some kind of horse/grasshopper squat. Hasbro probably sculpted him this way to give him some “alien” legs, as opposed to regular human stems. From what I can tell in the movie, and even in the accompanying photo art, Pablo has normal legs, and is just bending slightly to the side. Usually it’s a bad head sculpt that hurts a figure, not the legs. The paint ops on both figures are pretty solid but not overly exciting. Pablo’s robes were basically shot in their finished colors. The head and hands have a nice dirty yellow wash to them, but the eyes seem a bit too red. Sly’s various shades of blue stand out quite well, but her face seems to be brighter than the source material. The eyes are painted wide and white, and her eye shadow is bright blue as opposed to grayish. The wash on her arms is serviceable enough, but uneven in spots. Just like the two female figures released along side her, Sly isn’t going to be used for a lot of action poses. Still, Hasbro outfitted her with five points of articulation: shoulder cuts, a ball-jointed head, and limited ball joints at the elbows. 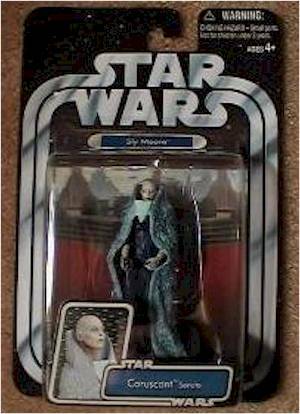 While not super-poseable, Ms. Moore can certainly strike a pose or two in her given profession as Palpatine’s aide. The elbows are a nice surprise on this figure and allow some decent variation in her arms. A Jedi figure on the other hand must be articulated for battle, so it’s natural to see Pablo Jill with more points –ten to be exact. Jedi Jill has a ball-jointed head and cuts at the shoulders, elbows, wrists, waist, and hips. The leg articulation is a little useless since the sculpting on the legs and the stiff back of the hanging robe even prevent a decent sitting pose. The arms give some room for play, but the arm sculpt and extreme cut on the left elbow limit his positioning. As I keep saying in all these reviews, Hasbro really needs to give up on the cut joints when it comes to shoulders and elbows. I’ve seen ball joints on the test shot figures for Episode III, so maybe we’ll finally get some real poseability all across the board. Pablo comes with his lightsaber and the ever-present black stand. The lightsaber blade is removable, but the peg seems pretty small for the hilt. The hilt design is new, but one of the simpler-looking ones around: basically a glorified tube with a button. The saber hilt I got also had a crack in the top. 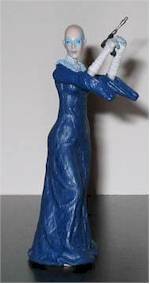 Sly fares a bit better with her outer robe and pistol in addition to the same stand. The pistol appears to be new, but is a little rinky-dink in design. Hang onto the rubber band wrapped around it and Sly’s hand. The outer robe has a nice shag-carpet design going on, and looks pretty close to the source material, except for its darker color. Both these figures seem much more solid than the two Episode I girls in this wave. Sly’s shoulders are a little flimsy, but not too bad. Prices are back up to around five and a half bucks at my local Target, but you’ve got to find them first. Pablo is probably going to be harder to find since Jedi are always in demand. Amazon.com has both of them in at $7.99 a pop, which is probably your best bet online. Overall, this first wave is the beginning of figures meant to tide us over in between the end of the VOTC run and the Episode III and second wave of Clone Wars figures. So far they haven’t been all that great. Sly Moore looks decent on display, but her scene specific-ness hurts her in the end since it’s not a diorama one is likely to create. Pablo Jill helps to fill out prequel Jedi in any display, but could have been better articulated. Those weird legs don’t help either. I’m still undecided as to whether or not I’m going to pick up the fifth figure from this wave, Yarua the Wookie senator, since I have no use for him in any of my displays. Based on the four I snagged, I think I can wait. 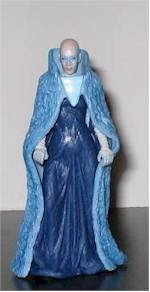 Figure from the collection of King Randor.